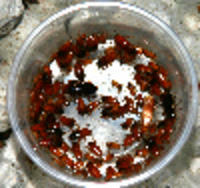 Our Live Roaches are healthy and are guaranteed to arrive alive. Shipped VIA USPS Priority Mail Monday Through Wednesday for most of the country. Shipped Monday and Tuesday to the West Coast. Roaches are a great reptile food. Hissing roaches make great pets. My favorite is Blatta Laterallis. They don't climb or fly and they breed like crazy. I have listed nutrional info for each roach so that you can pick the one that is right for the nutrional needs of your reptiles. I have also compared this to crickets and mealworms. The nutritional analysis was completed New Jersey Feed Laboratory, Inc.